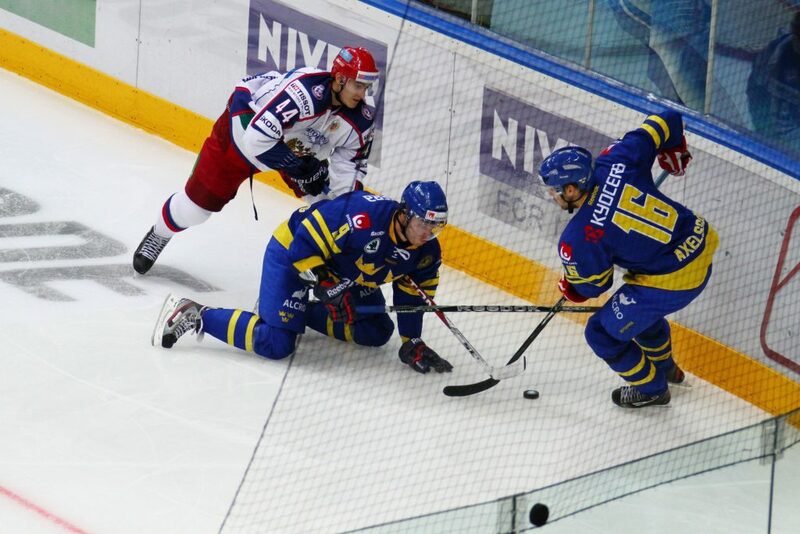 In Sweden’s game against Austria the other day, Filip Forsberg scored a hat-trick. In todays game against Latvia, Loui Eriksson, playing in the same line as Forsberg, scored four goals, but a bad call by the referees cut the number down to three. Nevertheless, another hat-trick from Team Sweden. Looking at the first half of this game, it was an even tale between two sloppy teams. Latvia put on a good fight and Sweden took a couple of bad penalties in the beginning of the second period. However, in games like this, when one team have players with a little more edge, that team often come up on top. That was the case today. Eriksson scored the first goal in the first period and the second in the middle period. Latvia reduced the lead to one but soon thereafter Filip Forsberg put the puck up high in the Latvian goal, on a penalty shot. With Sweden’s Three Crowns in a 3-1 lead with three minutes left of the period, Loui Eriksson did his third goal of the game. However, the referees did a bad call, calling it obstruction of the goalie. The replay show that clearly, that was not the case. With 14 seconds to go in the second period, justice was made, and Eriksson completed his hat-trick, scoring 4-1 to Sweden. In the third period Oscar Möller, Jacob Josefsson, Joel Lundqvist and Victor Rask scored one game each, making it a total of 8-1 to Sweden that continues to score a lot of goal in this tournament: 5, 6, 8 in the first three games. Russia hadn’t lost a game in the World Championships since 2013 before todays game against Team USA. However, the young americans, that mostly come from college hockey, managed to create a small “miracle on ice”, winning the game with 4 goals to 2. Trevor Lewis gave USA the lead in the first period. Anton Belov tied the game in the second period just to see Torey Krug giving USA a 2-1 lead once again a few minutes later. With less than ten minutes to go of the game Mark Acrobello extended the lead with another goal. Sergei Plotnikov created some nerve in the game, reducing USA’s lead to 3-2, with four minutes to go. However, Brock Nelson put the last goal of the game in the open Russian net and team USA have broken the Russian winning streak of 12 straight games since 2013. USA might be up to something big this tournament, winning clearly against Team Finland with 5 goals to 1 in their first game. We got to experience lots of good hockey yesterday, but this game between the host nation and Canada was probably the main event. The home team put good pressure against Mike Smith in the Canadian goal at first, and he made some good saves. Then Jordan Eberle made a typical Canadian goal, grabbing the puck behind the Czech goal, bringing it up front and just shuffle it in between the goalie and the post. Many European forwards can learn from that distinctive move. Canada also scored their second goal with one minute to go of the first period, but only 22 seconds later Martin Erat could reduce the lead 1-2 before an excited home crowd. In the second period Czech Republic tied the game, but Canada took a 3-2 lead shortly thereafter. The third period were mostly about Canada. With two straight power play goals, one signed Sidney Crosby, they were in a comfortable 5-2 lead. Czech Republic made a late 5-3 goal and pulled their goalie but Canada got the last word in this game by putting the puck in the empty net. Canada will meet Sweden in the next game, it will be a real test for Three Crowns!